Muslims across America are demanding Islamophobia be stopped by creating a false rise in what they consider anti-Muslim rhetoric. Islamophobia is a word manufactured by the Muslim Brotherhood in an effort to invent a false sense of victimhood. Islamophobia is defined by Muslims as those who hold an irrational fear of Islam, and is seen as a mental deficiency. The word itself means a fear of Islam, but the word has morphed into meaning a hatred of Muslims, racism, or bigotry. It encompasses negative words that cause discomfort and embarrassment, thereby causing people to think twice about speaking negatively about Islam and Muslims. Being labelled a hater or racist (which Islam is not a race) can get you fired, lose family and friends, or lose business. All fears of the American people. Islamic organizations like the Council on American Islamic Relations (CAIR) have created a sense of urgency in hopes the government will step in by criminalizing what they consider hate speech. Incidents have been fabricated to make it appear there is a spike in anti-Muslim sentiment which in turn they say promotes violence, vandalism and hate. HOWEVER, the most important point is not about Islamophobia but rather how it is being used by Muslims. Their efforts to end Islamophobia have instead created a national security risk. All because Muslims label these Islamophobic. All of these things we have viewed as small incremental changes, are now the result of our law enforcement agencies calling Islamic terrorism acts of domestic extremism. By not immediately designating killings such as San Bernardino, Chattanooga, Fort Hood or Garland TX as Islamic terrorism, they are falling into criminal categories rather than terrorist ones. 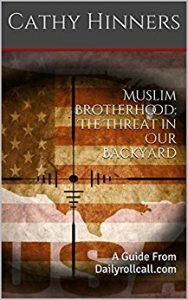 We are becoming desensitized to the reality of an enemy who is fighting in the name of Islam that has an ideology that is dismantling and destroying America. Next → Next post: The Buckle of The Bible Belt..May Soon Be Down Around Its Ankles.